MELVILLE, NEW YORK, September 26, 2007 - FONAR Corporation (NASDAQ-FONR), The Inventor of MR Scanning, reported today that The Wall Street Journal announced in Monday's edition (9/24/2007) that out of over 800 contenders FONAR has been named one of two runners-up for The Wall Street Journal Technology Innovation Award for 2007. The award is for the FONAR UPRIGHT Multi-Position MRI. The news editor of the Journal congratulated FONAR president and founder Raymond V. Damadian, MD, in an email that stated: "We are pleased to inform you that FONAR is a runner-up in the Medical-Devices category of this year's Wall Street Journal Technology Innovation Awards. You should be very proud of this achievement. We received more than 800 entries, with only about 4% receiving an award. Needless to say, the competition was extremely intense. Full coverage of the awards appears in The Wall Street Journal's three global editions on Monday as well as for online subscribers at http://online.wsj.com/page/2_1323.html." Dr. Damadian was also invited to an awards ceremony and dinner on October 24 in Redwood City, California, at the Sofitel San Francisco Bay Hotel. Last year FONAR was awarded the North American Medical Imaging Industry Innovation and Advancement of the Year Award. At that time, a Frost and Sullivan spokesman said, "For nearly 30 years, FONAR has led the medical imaging industry in promoting the clinical utility of MR and the multitude of applications that can be performed with this technology. In recognition of the company's longstanding role as a pioneering innovator of MR technology, Frost & Sullivan is proud to bestow upon FONAR the 2006 North American Medical Imaging Industry Innovation and Advancement of the Year Award." Dr. Damadian said, "I am delighted that FONAR has received The Wall Street Journal's recognition for our FONAR UPRIGHT Multi-Position MRI. It is something that all of our employees and users can also be proud of, since they all participate in creating the impact that the scanner is having on medicine." As part of the 2007 award nomination process, The Wall Street Journal screened more than 800 applications, narrowing the field to about 150 entries. A panel of 13 judges picked category winners and runners-up in 12 different entry categories, including computing systems, energy, environment, materials and other base technologies, media/broadcasting, medical research, medical devices, network/internet technologies, network security, semiconductors, software and transport. Each entrant was required to offer extensive details and explain why the entry merited consideration. Judging criteria included innovativeness, clarity of explanation, whether the innovation was covered by patents and if it had achieved some measure of success. - The innovation should have gone well beyond what already existed and cannot simply represent incremental improvements. - It needed to address major challenges for which new solutions would have a wide-ranging impact in a particular industry. - The written application needed to be supported by rigorous data rather than unsubstantiated claims of potential. FONAR has the most accomplished history of any company in MRI. The company's heritage helps to document the quality of its products and distinguishes it from all other MRI companies. A timeline of its achievements follows. It includes the groundbreaking discovery of the principle that makes MRI imaging possible, the patent for the first MRI, and the sale of the world's first MRI. March 1972 - First MR Patent Filed (3D Serial Voxel Scanning Method). Patent Issued 1974. 1976 - The Struggle Begins. Expert Declares, "Any further discussion of scanning the human body by MR (NMR) is visionary nonsense." 2007 - National Inventor of the Year Award for the UPRIGHT Multi-Position MRI. More about the FONAR UPRIGHT Multi-Position MRI. The FONAR UPRIGHT Multi-Position MRI is a dramatic advance over all other MRI's, which can only scan the patient in a recumbent-only, non-weight-bearing position. The UPRIGHT allows the patient to be imaged upright, with the weight of the body on the spine. Most patients are scanned sitting, while they enjoy watching TV. Patients can also be scanned in flexion, extension, rotation, as well as lying down. This positional imaging allows surgeons and radiologists to see patients in the position of their symptoms. Studies and physician experience show that diagnosis using the FONAR UPRIGHT changes surgical protocols and provides better surgical outcomes in approximately 20% of the cases. The FONAR UPRIGHT Multi-Position MRI is also unrivaled in patient comfort. It has a near zero claustrophobic rejection rate by patients. 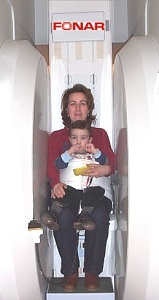 It can scan obese patients who cannot fit into a recumbent MRI, and it allows imaging of children while they sit in their mother's lap. Over a half million patients have been scanned by the FONAR UPRIGHT MRI. To date, 152 UPRIGHT MRIs have been sold. The superiority of the technology is achieving wider recognition every day. FONAR has invented another breakthrough MRI, the FONAR 360. It's a room-size recumbent scanner that optimizes openness while facilitating physician access to the patient during surgery. FONAR is headquartered on Long Island, New York, and has approximately 400 employees.